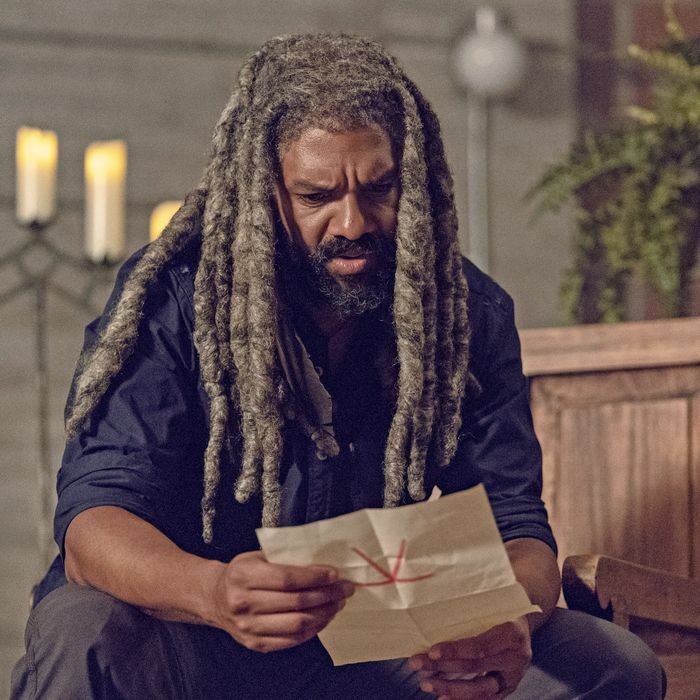 An old threat and a new one are the focus of this episode, as Daryl’s rescue party deals with the fallout from crossing the Whisperers and Zeke’s Faire hits a snag thanks to a mysterious band of cinephiles who call themselves the Highwaymen. This leads to a few surprises (didn’t expect to meet a whole new group at this point in the season, or that they’d be so easily converted from enemies to pals) and some no-brainers (Henry and Lydia are still dumbasses). With Beta on the hunt, Connie has a plan. There’s a high-rise under construction nearby where her crew used to stash supplies. The strategy: take the high ground, separate the Whisperer strike team from their walkers, and set a trap. Daryl seems more and more impressed by Connie at every turn. Not to get all Days of Our Lives about this, but there’s chemistry between these two. Could Connie turn out to be the woman who softens Daryl’s hard heart? Or is there a hookup ahead, at least? Meanwhile, the Kingdom faces another logistical challenge with Zekeapalooza. Remember that weird red symbol on the street sign after they raided the movie theater? Turns out that it’s the very minimalistic logo for a group called the Highwaymen (clearly all the graphic designers in the greater Virginia-D.C. area are dead). They’ve ambushed Jerry’s scout patrol and stolen all their gear, including Jerry’s sword — which, if I heard correctly when he whispers to Zeke, is named Janis Joplin. Queen Carolas has a very un-Carol-like take on the Highwaymen’s demands, opting to negotiate rather than fight. She notes that they could have simply killed Jerry’s group instead of robbing them, and as we all know, even in the middle of a zombie apocalypse, grammatical correctness is next to godliness. One thing Carol knows for sure: these Highwaymen definitely ain’t Jed’s group. (That’s because she burned Jed’s group to death, ICYMI). While the standoff with the Highwaymen comes to a peaceful conclusion, much blood is spilled in the showdown between Daryl and Beta. (Love it when Daryl talks tough, like when he asks Lydia for a scouting report on Big B: “This Beta, he their best? Good. We’ll kill him first.”) Henry and Connie fare well in the fight — save for Henry’s nasty leg wound — but the title bout is Daryl versus Beta’s hit squad. After Daryl delivers two vicious kills — one with an axe followed by a merciless throat-slice — it’s time for the main event. Despite what appears to be a “Have A Nice Day” T-shirt under his jacket and his penchant for bursting through walls like the Kool-Aid Man, Beta is one tall drink of trouble. Daryl appears to have met his match, and at one point, I think both of them are holding at least 13 knives simultaneously. The brutal donnybrook ends with Daryl knocking Beta into an elevator shaft, hocking one on his corpse for good measure, and strutting off like a boss. But slow your roll, bro. The plan worked nearly perfectly, until Daryl breaks the first rule of superheroing—always make sure the bad guy is actually dead. Beta’s in rough shape, but appears to be surprisingly mobile for a guy who just fell a few stories onto his back. This development is bad news for the Faire once Beta hobbles home to Whisperville and reports to Alpha. The Highwaymen definitely did not know their deal would involve fighting a bunch of skin-mask-wearing freaks. Only upside when the Whisperers crash movie night: at least they talk quietly.